Posted 6/27/2016 8:32pm by Jennifer. The garlic you will be receiving this week is fresh garlic. Some people call it green garlic. It has not been dried and cured, so it will not store for a long period of time on the counter. It should be stored in a closed container in the fridge and used relatively soon. It has a more potent flavor than dried garlic, so adjust your recipes accordingly. This week you will be getting another bunch of beets. In addition to the recipes I shared last week for roasting the beets or using them in a cake, you might also like to try this special treat for your loved ones. You will be getting a bunch of Swiss Chard. Once again you can saute this just as you would any other green, or if you would like to try something new, how about stuffing the chard - kind of like stuffed cabbage rolls. You can adjust the filling to your family's taste. Here are three recipes for stuffed chard, each with a different filling. Posted 6/20/2016 8:28pm by Jennifer. The best way to store your beets is to first cut the tops off, and store the tops and roots separate. This will keep the roots from getting spongy and extend the roots' shelf life dramatically. I usually saute the beet greens like I would any other green (with olive oil, garlic, salt & pepper). I also sometime slice it finely and put it in pasta dishes or soups at the very end of cooking. This is a sneaky way to hide veggies in your kids' meals. They're also good in your favorite juicing or smoothie recipes. I only peel them if the skin is tough (not usually the case with spring beets). Chop them up and toss in olive oil with a couple of cloves of smashed garlic. Season with salt, pepper, and rosemary. Roast on a baking sheet at 400o for approximately 30 min. These roasted beets can be used in salads or as a side dish on their own. Sometimes I roast the beets along with a couple chopped potatoes, garlic, chopped carrots, and chicken thighs drizzled with olive oil and seasoned on a baking sheet for a one-pot meal. In this case I would bake for 45 minutes. Here's a delicious chocolate cake recipe that uses beets in the batter. It's super moist. 1. Preheat oven to 375. Grease and flour a 10-in. fluted tube pan. 2. In a mixing bowl, cream 3/4 c. butter and brown sugar. Add eggs; mix well. Melt chocolate with remaining butter; stir until smooth. Cool slightly. Blend chocolate mixture, beets and vanilla into creamed mixture. Combine flour, baking soda and salt; add to the creamed mixture and mix well. Pour into prepared pan. 3. Bake for 45-55 minutes or until toothpick inserted near the center comes out clean. Cool in pan 10 minutes. Move to wire rack and cool completely. Before serving, dust with powdered sugar. Posted 6/13/2016 8:24pm by Jennifer. 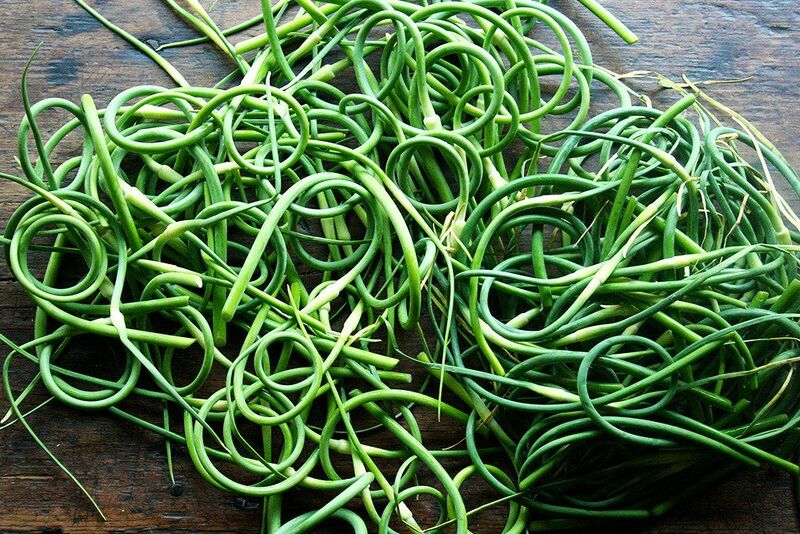 Most of the items you will receive this week are pretty common, except you might be asking, "What is a garlic scape?" Here they are pictured below. Garlic scapes are the tender shoots from the garlic plant. If these shoots are left on the plant, they will produce seeds and make for a smaller head of garlic, because the plant will put energy into making seeds and not a garlic head. So, we pull scapes in June, so we can harvest bigger garlic in July. The scapes have a mild garlic flavor. Some people eat them raw, others roast them in the oven. I like them tossed in olive oil with salt & pepper and grilled. They can be chopped up and put in a stir fry to add a mild garlic flavor. I've also chopped them up and placed them in a homemade vinaigrette for salads. You can also use them in pesto. The possibilities are endless! Here's a link with a couple more ideas. The strawberries are tasty eating by themselves, or top them with some freshly made whipped cream for a healthy dessert, or pair them with the fresh spinach for a delicious salad. The following recipe is similar to how I prepare my spinach salad, except for the dressing I use whatever vinegar I have on hand (usually balsamic or red wine), and I use honey or stevia to sweeten. Hooray for the Good Bugs! Posted 5/4/2015 9:45pm by Jennifer. We recently had an outbreak of aphids in our greenhouses, which is very common in greenhouse operations this time of year, as these insect reproduce rapidly. These destructive pests have their favorite plants to snack on: calibrochoa, gerbera daisies, and sweet potato vine, to name just a few. We are extremely happy to say that we have had much success this season using organically approved (OMRI listed) pesticides, and integrated pest management (IPM) methods, and have not had to use any synthetic pesticides on our flowers! We are not required to use these procedures on our flower plants, as they are not certified organic, but we feel it is important to try these environmentally friendly means before we utilize any conventional products. Integrated Pest Management (IPM) involves releasing beneficial predatory insects on the plants hosting the aphids. This season we have used ladybugs and green lacewing eggs. These two types of beneficial insects are known to especially like aphids. We have released 4500 lady bugs twice this season, and will release another 4500 in the upcoming week. The green lacewing eggs will rapidly develop into the larvae stage, which voraciously feed on aphids. We released 5000 of these eggs already this season, and will release another 5000 in the upcoming week. The release of the beneficial insects was an exciting event for the kids. They especially enjoyed releasing the ladybugs, because they are beloved by everybody. We released them in late evening, because ladybugs don't like the hot mid-day sun. In fact, if you search for them during the day, you're hard pressed to find them, because they are usually enjoying the shade under the leaves. Posted 4/17/2015 10:59am by Jennifer. Now is the time to start thinking about planting a garden, and we are happy to announce that we are a proud sponsor of the Community Garden at Oak Grove Lutheran Church. Oak Grove Lutheran Church is located on Harkins Mill Rd. in New Sewickley Twp., just outside of Cranberry Twp. If you would love to have your own garden, but don't have the space at home, this is a great opportunity. You get your own 10'x20' plot to plant whatever your heart desires. Does your business/organization do community outreach? Think about having a plot to grow food for those in need in your area. Details are below, and there will be an open house at the church on Saturday, April 25th, at 4pm to get even more information. Posted 2/9/2015 10:24am by Jennifer. Thank you to all our family, friends, employees, and especially, our loyal customers who make it possible to reach our ultimate goal as farmers - providing high quality, nutritious food to our community. Did you know that when you stop by the farm or a farmers market to make a purchase, you're doing so much more than simply buying flowers for your yard, more than buying corn for your next cookout, more than buying pumpkins for your family's jack-o-lantern? When you make a purchase, you help our family farm stay in business - growing food for other community members throughout the Pittsburgh region - families trying to make ends meet, wanting to provide a good life for their children...just like me and you. Every year our farm teams up with the Greater Pittsburgh Community Food Bank and other area food pantries to get real food to those in need. Together - you, our farm, our neighbors, make a difference. We received recognition from the Greater Pittsburgh Community Food Bank for our donations in 2014. In our opinion this letter should not just be addressed to our family and employees. It should also be addressed to our loyal customers too! Thank you! Posted 11/15/2014 11:51am by Jennifer. We've been featured in the latest issue of InSeneca Valley Magazine! Here's a copy for you to learn more about us and why we do what we do! Farming is a lifestyle choice as much as it is an occupation. It’s usually not about making tons of money, but more about the satisfaction of watching something grow and having people appreciate your work, knowing that they are getting really great, quality food that is essential to life and health. The Brenckle family has been committed to that purpose for five generations now. Fred Brenckle planted his first crop on Glen Eden Road in 1949, according to grandson Christian (Chris) Brenckle. “He was a typical truck farmer, growing kale, mustard greens, turnips, beets, radishes and lots of tomatoes,” explains Chris. The elder Brenckle planted somewhere between 10,000 and 15,000 tomato plants – an incredible amount considering that the equipment he used to produce his crops was very basic compared to today’s complex line of farm implements. The farm later passed to Fred’s son Tom, who was the youngest of nine children. As the children moved away and there was less help in running the farm, more sweet corn was grown and less labor intensive crops. In the 1970s, the farm took the shape of a commodity farm, growing more grains, along with the corn. In the 1980s, the Brenckles’ farm entered the wholesale flower market, supplying mums, tulips and other products. Chris, 38, works with his wife Jennifer, his father, Tom, and several other family members who pitch in to help in busier times in running the farm. Initially, Chris and Jennifer were both working fulltime day jobs and working at the farm in the evenings and on weekends. At a certain point, they made the difficult decision to quit their day jobs and commit themselves to farming full time. One of the latest changes to the farm is the commitment to growing organic crops. “We’ve never really been chemically dependent,” laughs Chris, “so we were never really that far away from being organic.” But about eight years ago, the farm made its first official foray into the world of organic farming when a neighboring farmer wanted to plant some organic crops on their land. “We saw the difference that being organic made at the market. It set us apart,” explains Chris. “The most daunting aspect of becoming a certified organic grower is the paperwork.” Four years ago, the hurdle was overcome when the farm made it official with an organic certification which facilitated a name change to Brenckle’s Organic Farm and Greenhouse. Though the farm has lived through many different kinds of farming and the fickle ups and downs of the commodities market, it has always been a Brenckle family endeavor. The faces are both young and old as the knowledge of how to grow things passes down through the family bloodline. There’s reason to be hopeful that the Brenckles’ Organic Farm will be continuing for another generation with Chris’ children, Josie, 8, and Charlie, 6. His son also insists on having a garden at their home in town. Chris says that both of his children love the farm life. “They enjoy seeing things grow. My wife and I both stress what really good food is and they both show an interest,” adds Chris. Posted 6/23/2014 6:41pm by Jennifer. Last week we were able to transplant all of our vine crops - zucchini, cucumbers, watermelons, cantaloupes, etc. These crops are extremely susceptible to pest damage at the time of transplant, so we cover them with floating row cover to keep the pests off. This can be a boring job for kids, so Josie tried to make it fun by wearing a "fancy" scarf of blooming vetch. Charlie, on the other hand, had had enough and decided to stage a protest by lying down in the field. Also last week one of neighbor friends, Mike Lewis from Lewis Family Farms, was nice enough to help us bail the rye that we used for cover crop this past fall. (Lewis Family Farm raises grass fed beef and pastured, GMO-free poultry) We used this bailed rye as mulch in our pepper and tomato fields. Over the weekend we started pounding stakes for our tomato plants. We're almost done, but need to get some replacement stakes from an Amish gentleman next week. In the meantime, we will start tying up the tomato plants that we have staked. This will keep the plants and fruit up off the ground, which increases air flow through the plant and reduces the risk of certain types of blight. This is the time of year when I get really excited about tomatoes, basil, and fresh mozzarella cheese. I could live off these few items all summer long! Posted 3/25/2014 2:07pm by Jennifer. Posted 1/14/2014 1:42pm by Jennifer. Before Christmas, we planted all of our Easter bulbs, and put them in the cooler. These will be beautiful daffodils, hyacinths, and tulips of all colors come Easter Sunday. Tom's a pro at this, since he's been forcing bulbs since he was a boy. We sowed our onion, chive, and leek seeds, since these have very long growing seasons. Here are some chives that were planted on January 3rd, and are just now sprouting up. We've been busy sowing seeds for annual flowers, planting cuttings for hanging baskets and making repairs/upgrades to our greenhouses. So, no, we don't usually get to go to Florida, but we do get to spend lots of time in a warm place full of greenery - which is almost just as good! Stay safe and warm and think spring!